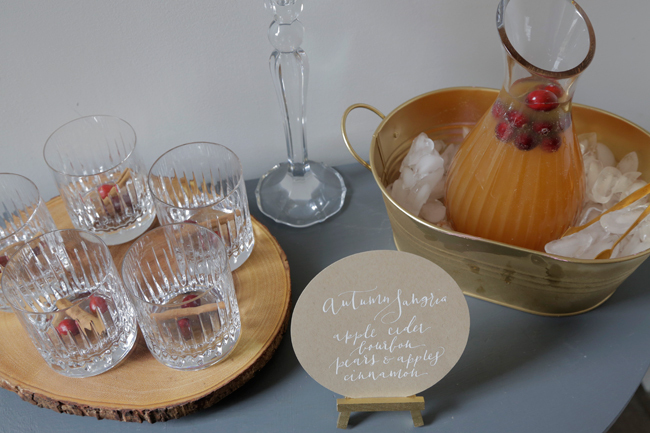 I made this Autumn Sangria for our Friendsgiving signature cocktail, and it would be perfect for Thanksgiving as well. Of all the cocktails I've served at parties in the past year, this one was by far the most popular. We were also serving a nice sparkling wine we brought back from our last trip to Napa, but everyone loved this cocktail so much they barely noticed the bubbles - rare for our group of friends. Rain moved our dinner from the terrace to the living room, leaving very little space for mingling, so we had to move cocktail hour to our bedroom. To guide guests away from the cramped living room and kitchen, I set up this cocktail station in the hallway just outside of the bedroom. This is a trick I learned when I worked in event planning - station food and drink in different areas of the space to get the crowd moving. Combine 1 bottle of white wine (I used a sauvignon blanc) with 2 cups of good quality apple cider and 1/2 cup of bourbon. Add 1 apple and 1 pear, sliced. Throw in a few cinnamon sticks and chill overnight in the refrigerator. 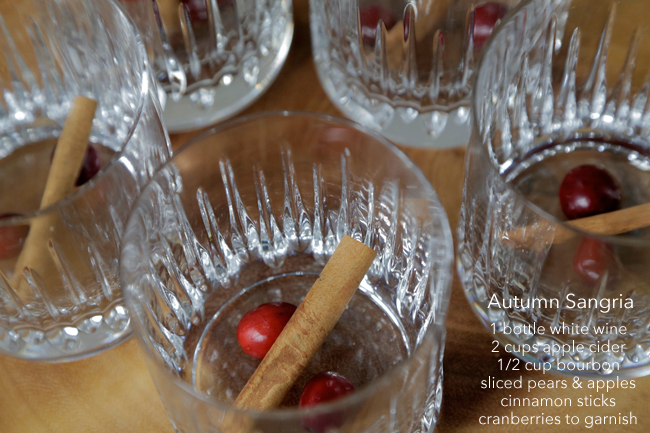 I put a cinnamon stick and a few cranberries in each glass for a festive touch. 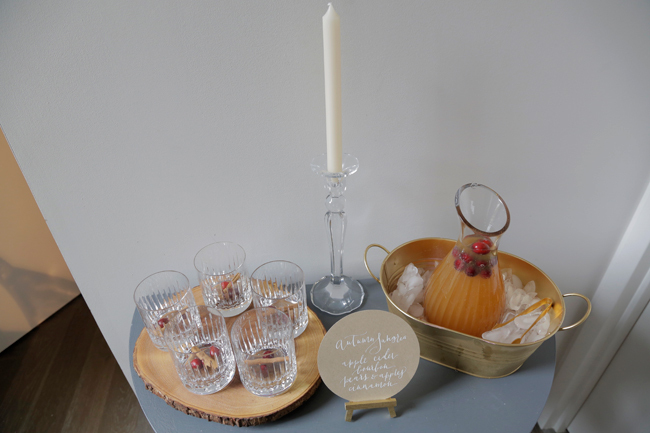 I love these acacia wedge servers for autumn and winter entertaining. The natural element lends a rustic feel to the otherwise fancy crystal. To keep the sangria cold I used a mini beverage tin and put tongs on the side in case anyone wanted to add ice to their drink. 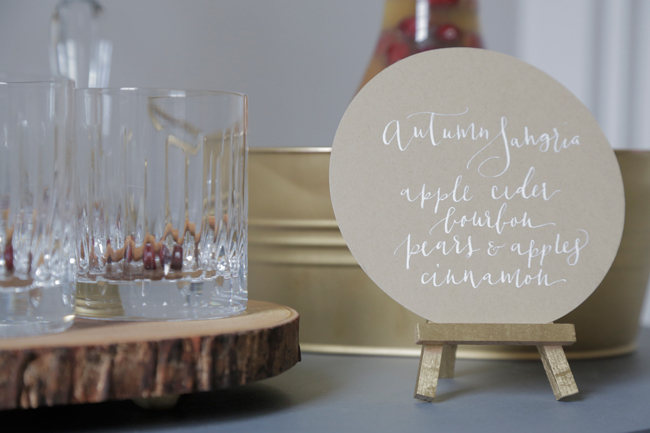 If you'd prefer a sparkling version of this cocktail, I've made that too! 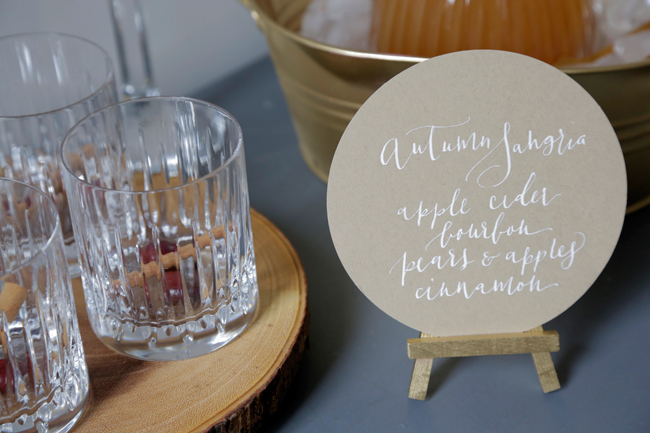 You mix the cider and boubon with the cinnamon sticks and fruit (leaving out the wine). 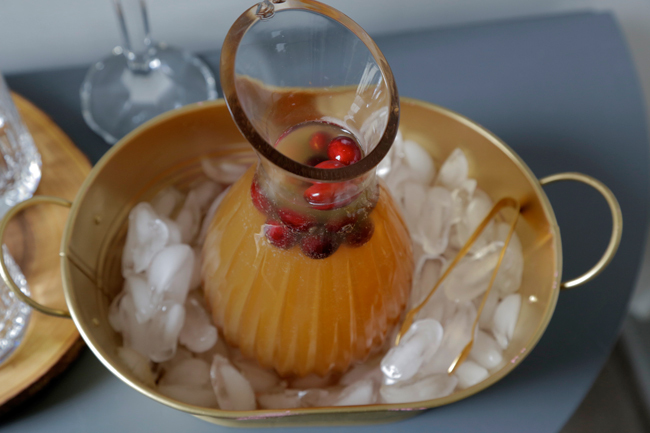 Then when you're ready to serve, pour some of the cider mixture into the bottom of a glass and top with champagne. Extra points for garnishing with a sprig of rosemary! Hi Jennifer - Yes, that bottle does sound perfect! And a holiday brunch the perfect setting. I'd love to see photos!